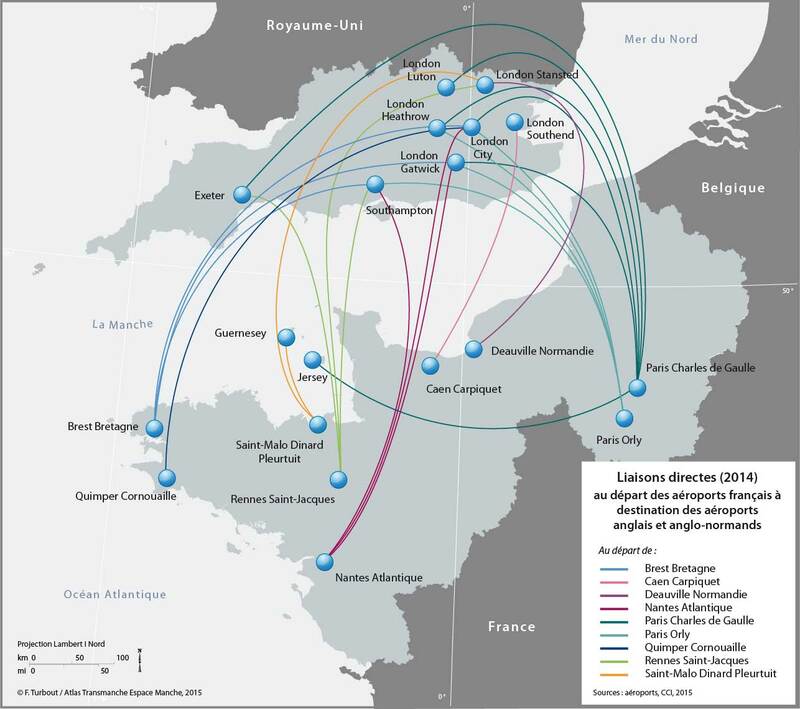 Air traffic in the Channel Area (France-England-Channel Islands) lies 56 airports with also many airfields, often small size.At departure of these airports, 59 airlines connect both sides of the English Channel through 99 direct regular links (2014). It must add all links incorporating one or more stopovers and all low-cost companies, whose numbers links depends on their trade policy. Since fifteen years, these companies have developed enormously in the area. Ryanair, Flybe, and EasyJet provide about ten links departing from Southampton, Exeter, London Luton to Brittany, Paris airports or the regions of Southwest and Southeast of France.All of this traffic has allowed the carriage of more than 247 million passengers to the cross-border area and the rest of the world in 2013, including 17 million (without passenger traffic of London and Parisian airports). This traffic represents 2 million commercial movements of which 85% are due to London and Paris. The area hosts four of the major European hubs: London Gatwick and London Heathrow, hub of English companies, British Airways and Virgin Atlantic, and on the French side , Paris-Roissy and Orly, hub of Air France and its subsidiary short and medium haul flight, Hop, created in 2013.The whole consequent traffic of people and goods is completed to 800 000 non-commercial air movements at the departure of the airfields and regional airports. With regard to maritime traffic known to be intense (between 30 and 35 million passengers per year), air traffic holds an important place in the organisation of transport between the two sides of the English Channel, low-cost airlines have clearly understood this fact.